A wealthy executive comes down with a terminal disease, his shareholdings are pledged as collateral and are in default. Two cunning executives use a complicated financial transaction to recapitalize the company further solidifying control. The only thing missing from this is a few terrorists and a bomb and this could be an episode of "24". Instead it's the storyline for Fortune Industries a tiny Indianapolis company going through a seismic change in ownership that will create wealth and throw off cash. So where to begin? A long time ago in a galaxy far away companies had human resource departments brimming with staff. The HR department was responsible for all sorts of miscellaneous functions such as managing defined benefit plans, screening and verifying employment candidates, and payroll services. Eventually a company figured out they could provide these HR services for many companies at once and due to economies of scale reduce costs for clients. The Professional Employer Organization (PEO) was born. Companies started to outsource HR functionality and reduce HR headcount, PEO firms prospered and everyone was happy. Well not everyone, employees pine for the old days when they could walk down the hall to ask a question instead of calling a 1-800 number. Fortune Industries was formed in 1988 as a combination of three PEO organizations Century II, Employer Solutions Group, and Professional Staff Management. The three subsidiaries are amongst the oldest PEO's in the country and are considered market leaders. The company was founded and run by Carter Fortune who remains the Chairman of the Board. The company is closely held with over 60% of the common shares owned by Mr. Fortune, the CEO Ms. Mayberry, and the CFO Mr. Butler. Outside shareholders currently own about 32% of the company. The company also has a class of preferred stocks which is entirely owned by Mr. Fortune which pays him a generous dividend. What could go wrong with this? The company is humming along on all cylinders, reporting profits and recovering from the recession. Well it seems the Director Mr. Fortune had a bit of financial difficulties on his own. He pledged his shares in Fortune Industries to the Bank of Indiana as collateral for a loan. Then Mr. Fortune was diagnosed with a terminal illness and went into default on his loan. The bank that holds the loan was working to re-negotiate but was purchased by a larger bank. The bank holds a lien on Mr. Fortune's shares. What a mess! The company didn't want their largest shareholder to be a disinterested bank so they decided something needed to happen. They offered Mr. Fortune's stake in the company up for sale, a few buyers materialized but weren't able to secure financing. The Board then hired consultants to devise a way forward. The consultants recommended to the company that they do a reverse merger and cash out small shareholders, delist and save $150,000 a year. Then they recommended that a new entity purchase the company and convert the onerous preferred shares into a amortizing bank loan paid down over six years. The result of this transaction would be the CEO, CFO, and Mr. Fortune would own 91% of the company with $12m in debt of which $6m will be owed to a bank and $6m will be owed to Mr. Fortune. The money from the bank loan will be used to pay Mr. Fortune $6m in cash, and the other $6.3m will be given to him in dribbles through the payment of his note. The bank loan has an interest rate of 6% while the note to Mr. Fortune bears a rate of 10%. When the company announced their plan shares were trading in the $.46 range with consideration given to small holders paid at $.61 a share. The shareholder base doesn't seem to like the plan and presumably they've been selling their shares in droves with the price most recently at $.16 a share. The above two sections are a lot to digest, so take a break and go get some coffee. If you've made it this far we now need to think about two things, what will this company look like going forward, and with the sharp fall off in share price is there any opportunity here? To get a grasp of what the company could look like once the merger is complete I think it's appropriate to look at a pro forma balance sheet and income statement. My first thought when working through this was it's incredible how quickly wealth is transferred with debt. This was a company with a book value of $17m that is reduced to $6m in this transaction. The shares are currently trading slightly above book. Something to remember is over the next six years book value is going to double which is growth of 12% a year. This is simply due to the reduction of the bank loan. If the company used their cash to pay off Mr. Fortune it would reduce interest expense but wouldn't change the balance sheet at all. I think this might be part of their strategy, use some cash on hand to pay down a portion of the loan to the founder. Keep this thought in the bank of your mind when looking at the income statement. In the company's going dark filing they published a nice income statement showing the results over the past few years in addition to what they expect to earn in the next two and a half years. Of course no one knows the future, but these seem like reasonable estimates so I built my model with them. I used the number of shares that will exist after the merger is complete for past results for comparability sake. I also removed the SEC reporting costs the company expects to save in the future. As you can see the projection is very similar to a leveraged buyout. As the company pays down the bank loan interest costs decrease and net income increases. Earnings should increase even if the company just treads water. Debt will be 3x EBITDA and interest coverage will be covered by EBITDA 4.73x. 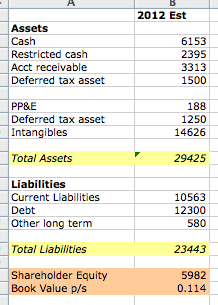 This income statement could change a lot with a few simple tweaks by management. For example if they decided to use half of their cash on hand to pay down the Fortune loan net income would increase by $.004 to $.032 a share, a noticeable difference. I think this transaction is good for the company, there is a lot of uncertainty if they continue down their current path. While the transaction is good for the health of the company shareholders weren't pleased. There are a number of ambulance chaser lawsuits and shares have sold down to $.16 a share. But all is not lost for someone who buys today. A buyer at this price gets a company with a P/E of 5.35 at slightly above book value. If they hold for the next six years and the company is able to pay off their loan book value will grow to $.22 a share and earnings could be in the $.05 range. If trades at the same multiples in six years as it does today it could easily be a double. Under a best case scenario the company is able to pay off both loans in the next six years which would result in a book value of $.56 p/s. Doing that would increase earnings by a cent or more per share. Instead of owning a double this could be worth 4x the current price or more. Of course a lot of things could go wrong as well. What was a very conservatively financed company has now become much riskier with a leveraged capital structure. If the economy hits the rocks again Fortune could have a hard time paying down the loans and the built in increase in EPS and book value could never materialize. There are plenty of private equity shops that built out little models like mine in 2007 who are looking at much different results right now. Of course I'm no expert in looking at these situations, so if you see an error or something I missed please let me know! I want to thank a reader for sending this idea along to me. Great summary, Nate. This one is very intriguing. Im not super familar with odd lot tenders (your disclosure on your position). What is your play there? Is the idea that you buy a small number and are looking for the $0.61 buyout price? How small a lot do you need to participate in that? Yeah, as the comment right below yours shows, buy 500 shares and in theory receive $.61/sh in cash. It seems there is some confusion, is it record holders only or record and beneficial holders? Two different filings say two different things. "(i) As to each record holder of the Company’s Common Stock, $0.10 par value (“Company Common Stock”) holding less than five hundred one (501) shares thereof on the date of this Agreement and until immediately prior to the Effective Time (including any heir or devisee of such record holder holding such shares pursuant to the laws of descent and distribution in that record holder’s domicile), such record holder’s shares of Company Common Stock issued and outstanding immediately prior to the Effective Time (other than any Dissenting Shares) will be canceled and extinguished and automatically converted into the right to receive Sixty-One Hundredths Dollar ($0.61) per share (the “Per Share Amount”); and"
So it seems to me that it could be the case that this offer is only valid if you own the shares of the company in your own name, not in street name. This makes sense because the only reason they give cash to holders of less than 500 shares is that they want to have less than 300 share holders so they can go private. Yes, I saw this, and this language is different from language in a different filing I had read on the transaction as well. So I'm not sure. In another filing it mentions beneficial holder which is what a street name designation is. I've done a number of these going privates in the past and I've always held them in street name and they've worked just fine. Where's the margin of safety? If Mr. Fortune was Chairman and ran the company, then it would be a stretch to say future earnings would be similar to historical. With the price right at book value, then there's a further downside that should be considered. I'm not sure there is one which is why I haven't invested. Mr. Fortune hasn't been involved in the day to day operations for a number of years though. There is the current CEO who has been in place since 2010 and then there was one previously who was there for a while, I don't remember the exact number of years. If this sold well below the "new" book value this begins to look much more interesting. Hmmm, earnings went positive and FCF increased starting 2009 / 2010. Sounds like a good move with the new CEO. Nate - doesn't the first condition require you to hold the stock on the agreement date and through to the closing?
" As to each record holder of the Company’s Common Stock, $0.10 par value (“Company Common Stock”) holding less than five hundred one (501) shares thereof on the date of this Agreement and until immediately prior to the Effective Time...."
Does this mean a new shareholder can not buy shares today? I was about to ask the same question. The filing even underlines the word "and". I interpreted this to mean that you had to own stock on the date of the merger agreement to participate in the odd lot tender. As to each Shareholder who is a Small Block Holder on the date of the Merger Agreement and until immediately prior to the Effective Time (including any heir or devisee of such record or beneficial holder holding such shares pursuant to the laws of descent and distribution in that record holder’s domicile), such Small Block Holder’s shares of Company Common Stock issued and outstanding immediately prior to the Effective Time (other than any Dissenting Shares) will be canceled and extinguished and automatically converted into the right to receive Sixty-One Hundredths Dollar ($0.61) per share. As to (1) each record holder of Company Common Stock that is not a record or beneficial holder on the date of the Merger Agreement and until immediately prior to the Effective Time and as to (2) each Large Block Holder, each such holder’s shares issued and outstanding immediately prior to the Effective Time shall continue to be issued and outstanding shares of the Company, which will be the surviving corporation of the merger. Sorry for the lack of clarification on this question, see the comment below this on plausibility. At the current price 500 shares is $87, it's worth the gamble in my mind. Worst case the stock suddenly goes to 0 on merger + one day and I lose $87, not a big deal. More likely the price will be close and I'll maybe lose $10 or so. If I'm always desperate I can sell at $.08 and I'm sure someone will gladly pick up my shares. While it may be FFI's intent that qualification for cash consideration be based upon ownership "on the date of the Merger Agreement and until immediately prior to the Effective Time," I'm wondering if the company can actually enforce these criteria. It seems to be unorthodox to say the least that the company is attempting to use two dates instead of one for determining how "small block" shareholders will be treated. I cannot remember a case where more than one date was used with any company making any determination about shareholders qualifying for anything. I took the gamble, I figure at worst I somehow lose my entire $80, but more likely I can sell at close to this price and maybe only lose $5-10. I'm willing to risk lunch at McDonalds for the potential of a few hundred dollars. When I think about this I can't see how the company can ensure that they actually have less than 300 shareholders if they use the merger date. Unless they think people will sell and no new buyers will emerge. I wonder how many people bought his tender without reading closely, maybe a few dozen, or maybe a few hundred. That could really change the outcome. I should try and contact the company for clarification and see what they say. There's a potential that their deal is disrupted if they stick to the Merger date. Nate, keep in mind that the DTC holds as a nominee all shares held in brokerages in street name in a single account called Cede & Co, and as a result the number of street name holders is actually irrelevant because all street name holders are counted only as a single shareholder (DTC: Cede & Co.) in the transfer agents records. Correct about DTC, but it really depends. Some of these reverse mergers have language that say beneficial holders (street name included) and others say only holders of record (actual shares). For FFI it says beneficial so street name would be included. I've seen with some companies that go dark they will publish the number of shareholders. I saw one recently that had 120 record holders and 50 beneficial holders, so well below the 300 count. It just depends on how close to the line management wants to play. The 300 is ambiguous and leaving all beneficial holders could result in over 300 actual beneficial shareholders but less than 300 record shareholders. The risk the company runs is that the SEC cracks down on this and reverses the going dark. This isn't going to happen, with the JOBS act the number of shareholders to go dark was increased to 1500. I think we're going to see a lot more of these transactions soon. "Upon the completion of the merger, each outstanding share of Common Stock owned by beneficial or record holders of less than 501 Shares on March 26, 2012 and who continue to own those shares of Common Stock on the effective date of the Merger (the “Small Block Holders”) will be converted into the right to receive $0.61 in cash, without interest and less any applicable withholding taxes. Upon the completion of the merger, each outstanding share of Common Stock owned by beneficial or record holders of 501 or more Shares: (i) on March 26, 2012 or (ii) on the effective date of the merger (the “Large Block Holders”) will continue to own the Common Stock of the Company which they currently own, which will be deemed to be shares of the surviving corporation’s common stock. The Rollover Shareholders have agreed to contribute, immediately prior to the completion of the merger, in the aggregate, 7,424,687 shares of Company common stock to Parent in exchange for shares of Parent common stock." It looks to me like you have to have owned the shares as of March 26th to participate?? However, as you point out for 90 bucks it may be worth doing just for the experience! Got to agree with Nate and Jim. I took the plunge for 80 bucks too. Since they haven't given the effective date of the Merger I don't think it makes sense for them to exclude the small block holders. I wonder if having the shares in Street name will matter? Either way how are they going to ensure under 300 shareholders without giving all shareholders under 500 shares the money. Of course if there are too many of those shareholders it could kill the deal..
ABV, the term "beneficial owner" signifies street name holders, so whether or not a holder owned certificates or through a nominee, such as a broker, won't matter. Is there a time table for when the tender goes through? Risk reward is interesting. THe only concerns are did you need to own shares as of the March 2012 agreement and do you need to own it in your own name. I find them anywhere and everywhere! I'm actually amazed myself at the constant stream of stuff I can find. The uncertainty is like you say the time table, and the agreement. There was some language that said June 30th was a possible close date, but if that failed it would be Dec 31st. Seeing as how we passed the 30th without anything I'd assume we've moved to the 31st. The second is who gets cashed out, there's some ambiguity around it. It is possible to read it as only holders on March 26th get the shares. But it's possible it could be all odd lot holders too. I took a gamble, it's only $80 so if it works out I'm happy, if not I'll probably lose $10-20 selling after the merger closes. The shares can be in street name, the documents mention beneficial holder which means street name holders. Nate, not so sure ambulance chasers don't have a legitimate case here. I know if I was an unaffiliated large-block shareholder, I would not be happy. Small shareholders (500 or less) are being taken out at a fair price, but non-insider shareholders are getting a raw deal. Mr. Fortune's bad luck has put him in the unenviable position of negotiating from a point of weakness, but in his case, he willingly took what was offered him. Unaffiliated shareholders did not share the same benefit in either accepting or rejecting an offer. There was nobody representing their interests at the table. Now the deal the CEO and CFO struck with Mr.Fortune was a very good one for the company. The Pfd valuation report stated it was worth $21.3M and that was a very fair price. So Mr. Fortune is being paid $12.3M (cash and note) for his ownership of the Pfd and his common holdings post merger are also further reduced from 60% to 20%. Three cheers for opportunistic management in taking advantage of the situation to get rid of these onerous Pfd's! Unfortunately, the opportunity to take advantage didn't stop there. The CEO and CFO own a measly 1% of the stock, but post transaction, they will own a whopping 71%. What exactly are they putting up to increase their stake by such a large amount? Well, they are putting their token amount of shares into CEP (the parent company) and they each put up personal guarantees of $750K for the loan. Their stock is worth less that $20K and their personal guarantees are very unlikely to ever get called because the company’s accounts receivable, property, and other assets will be used as collateral for the $6M in borrowings. Now what happened to the unaffiliated shareholders’ ownership percentage with these new common shares going to the CEO and CFO? Well their ownership was diluted from 39.1% to 8.6%, which coincidentally is the same percentage loss in value from 61 cents to today's 14 cents a share. Will CEP (the parent company) be on the hook for the loan and note? If the value of the Preferred purchase is mostly accruing to these 2 insiders, shouldn't the cost of it reside with them as well? Will the loans reside at the parent holdco level where they belong or will they be a liability of the company (the owned sub)? "Upon the consummation of the Merger, the obligations of Parent under the senior credit facility and the subordinated loan from the Company’s majority shareholder will become obligations of the surviving corporation." To add insult to injury, if you look at the fees of this transaction (about a half mil), they were all pretty much borne by the company and the little that was not ($50K), looks reimbursable after the merger. So the non-affiliated shareholders are not only getting screwed but paying for that privilege. At the very least, larger non-affiliated shareholders should have been taken out at the same price as smaller ones. These MBO's can be profitable for johnny-come-lately's like me. Management is shrewd. I really like that they are taking out the pfd, but don't like how they abused shareholders in the process. I think I will give them a call to see what they have to say. I'd also like to know what happens to their significant NOL's with the proposed 70% change in ownership. Nate, the book value will change with purchase accounting. Intangibles will likely be written down to zero, so it's negative book, but this is going to be a deleveraging, earnings story going forward, not an asset play. I called the company three time yesterday and left messages with three different officers. In the first call back I asked about any small holders being taken out of the stock when purchasing after the March date. The corporate attorney said you had to own the shares on March 26 "and" when the deal goes through. On the second call, I expanded our conversation with respect to corporate governance. I wanted the Kraft FFI 'fairness opinion' sent to me. She was reluctant to do so, but I mentioned I'm a shareholder and I wanted the complete version with charts, comps, and graphs, not the proxy's condensed version. She wasn't sure if she could send it, but I told her the proxy says she can, so to please send it. One of the items I wanted to see was the treatment of their DTA's. There is a valuation allowance on these, but they are real and significant assets nonetheless. I wanted to see how they were valued and what management thought of future prospects. I told her I wasn't clear on why the 'company' couldn't do this transaction vs. using a merger vehicle created by management? Large shareholders have been severely diluted. Great transaction in taking out the preferred, but couldn't this have been done in a more shareholder-friendly manner? The company gets the liabilities, but insiders get the shares. The CEO/CFO percentage of ownership went from 1% to 71%, while large holders were diluted from 39.1% to 8.6%. Incredible, where were the independent board members? She mentioned something about the current lawsuit, so couldn't talk about it, but I told her that was totally different situation. The plaintiffs in that case felt 61 cents was a ripoff. In this case, large shareholders are looking at 14 cents! I told her the preferred take out was a great move for the company, but when looking at the post merger results, no benefit accrued to the large unaffiliated shareholders. In fact, what senior management gained, large shareholders lost! She said the company was shopped and nothing came of it, so this was the best deal available. I said if the ultimate liability of the new debt resides with the company anyway, why didn't the 'company' do the transaction vs. the MBO sub. I'm certainly not opposed to the CEO/CFO gaining greater ownership post transaction but what they are actually risking should be commensurate with their potential reward. She had to talk to a committee of folks and get back to me in a couple of days. If the answer is not reasonable (and I have my doubts it will be), I will contact the lawyer that got shareholders a nice settlement with the thieves at Coast Dental (CDEN). This is a relatively small amount of money (a couple of million is being transferred from one pocket to another), but I got the impression those lawyers were that rare breed that actually believed in what they are doing. This case also strikes me as egregious management behavior, so they may take it on principle (and it doesn't look hard to win). I know this is an old post, but did you ever contact a lawyer? This looks like out and out theft to me. I did...see my blog from a couple of days ago...I have never seen such abuse of power and neglect for the shareholders...they left millions on the table from another offer and kept the shareholders in teh dark. Looks like Carter died and now they have some sort of merger going on. Any thoughts? I did not get cashed out yet. Did you? Check my blog below....have been paying a lot of attention to the acquisition and its players. Stockholders should be very upset as they got screwed! I have enjoyed reading you posts. I went looking when the acquisition took place. I became involved when I brought another buyer to the table with a far superior offer. After a conference call with inside and outside attorney reps and directors, they decided to not put it in front of the shareholders. I later came to know that the outside attorney who is responsible for representing the directors, told them the money was not guaranteed. In fact it was as he knew from having the equity investor and officers for buyers on the phone. After the call, my buyers even upped the cash amount on the table by $1.5 m. One of the directors tried to rescind his signature on the closing documents after discovering some inaccuracies in the information given to him from the attorney, accountant, and in-house attorney. There is a $500K to the outside attorney and $280K as a consulting fee in the proxy...anyone know who gets that? By my discovery, appears it goes to the CPA. Both fees were to be paid at time of closing. Our offer did not include any loan from FFI and had more cash on the table, along with a higher common stock payout as well as the preferreds. someone called it "theft" in a previous post....couldn't be more true. I contacted an attorney, as did the director. The attorney was shocked at the fees involved and the information not disclosed. There could be a malpractice suit there too. Anyone who invested after march 2012 have any insight on this.